Buy Bethan May Books a Coffee. ko-fi.com/bethanmaybooks - Ko-fi ❤️ Where creators get paid by fans, with a 'Buy Me a Coffee' button. 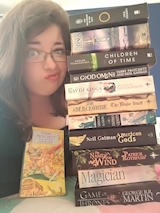 I am thirty-two year old Bethan, an avid reader living in Carmarthenshire with her husband and two children. Leaving reviews on Goodreads escalated into tweeting and bookstagramming (instabooking?) about books which has finally resolved itself into blogging; mostly about what I'm reading but sometimes about life in general too. Secured Payments. Support goes to Bethan May Books's account. Upgrade Bethan May Books to a yearly Gold Membership with a one-time payment.